Landscape photography is a discipline that many photographers desire to master, but sometimes we take landscapes for granted. We believe that landscapes are just there, waiting with the clouds and mountains for us to shoot. The reality is much more complex than that, and there are some things we need to know and respect, about Landscape photography in order to achieve breathtaking results. Using black and white is a great strategy, but there is more to nature than simply a monochrome conversion of our beloved RAW files, and I'm going to talk a little bit about them today. Unexplored nature is harder to see nowadays – since humans have explored almost everywhere – but there are still places in the world waiting to be explored by our photographic vision. All disciplined and passionate photographers have their own and peculiar visions of the world, and this broadens the possibilities for achieving great results. The first step for exploring some great black and white landscape techniques is to scout for them. Scouting can happen many times without you getting the desired shot or even a single picture, but this is okay. The main goal of scouting is to seek the best location from where you can take an image later. It's about pre-planning. Scouting is really important, and you must consider certain elements to maximize your previous scout. To begin building on these techniques, you'll want to block out plenty of time. I recommend you start scouting the local landscapes near your home because starting it when you’re traveling could result in very frustrating outcomes. Clouds, meteorology, weather, and sunlight hours. Filters boost photography in a way that no post-production maneuvers could ever render because they distort reality while the image is being captured. The most conspicuous results are created with ND filters, which alter the exposure by few or several stops depending on their optical configuration and design. Circular polarizing filters are great for landscapes because they reduce or alter reflections into pleasing results, and help highlight the sky by making blue tones darker. Due to the nature of Monochrome photography, these planned images can be boosted with harsher contrast without unpleasant results. Alright, this one is hard, I know. Still, you can achieve that vision with practice, or with a bit of cheating. There are two ways to get an instantaneous preview of a scene in monochrome format. The first one involves using a special filter that works more like a viewing device than a camera filter. The other one is to use live-view mode with the monochrome profile activated. Don’t look at live-view below your shoulders – it’s a great tool for precise focusing while shooting landscapes. It’s no secret that great landscapes are incredibly sharp, which happens thanks to tiny apertures (now you understand why the elite club of Ansel Adams was called Group f/64) and hyper focal-lengths. The best lens you’ll ever have in your hands requires a sturdy and trusty tripod. Period. The best glass in the world has little use in front of a magnificent landscape if it is not placed over a sturdy tripod. The reason why landscapes need a firm tripod is because slow apertures and slow exposure times are needed to achieve the best exposure. Want pure clarity in your landscapes? A tripod will also allow you to use the less-sensitive ISO settings (between 100 – 200), which have less noise impact on the image (which is great). After scouting, composing, setting the best filter configuration for the desired shot and clicking the shutter button, you'll have walked only half the road. The other half is about to come. Post-processing in black and white is, without a doubt, more flexible in terms of allowing more extreme setting configurations without getting eerie and odd-looking results. This happens just the same way film acted when it was developed – you could be sloppy when tempering the chemicals still you could manage to get the desired results (within reasonable limits) with a simple arithmetic calculation. It’s important, therefore, that you learn how to develop a RAW file, especially in terms of contrast. The most valuable secret for developing any image is to understand how colors interact with each other when converting them into a monochrome version. By contrasting the color channels – and keeping in mind the mechanics of complementary colors, for example, you can achieve outstanding results! After that, local adjustments with graduated filters and the key brush (I'm talking Lightroomian here, in case you got lost) will give your images the nudge they deserve. This is a simple-to-define task, but it requires patience and passion to get the best results. I strongly disagree with photographers who find this part of the photographic workflow tedious. Post Processing – it’s just as important as the shot itself. In the days of film, this was done at both the film development and printing stage, because both required chemicals and care. Ansel Adams was known for being extremely careful with his prints, and that is why his photographs are so desired and famous. It is valuable to learn about his passion in order to understand the importance of the work to be done after pressing the shutter button. Read and study Adams because of his consummate skill, his view of what looked good and the fact that he wrote in depth about these things. More Ansel Adams here. Unfortunately, HDR is presented to us in a democratized form that leads to frankly irresponsible and unaesthetic results. Some say the effects of HDR are “surreal” – but no, when done improperly, they are just ugly pictures. HDR stands for High Dynamic Range, and the principle is to give a proper exposure to each tonal range of the image. So images with blown-out lights will be correctly exposed, as well as those that are much underexposed. To explain more on Dynamic Range, check out this great article here. The thing is, HDR technique can result in images with a high tonal range without either solid whites or solid blacks. Pretty much like the Zone System Ansel Adams created. When doing HDR, please be careful so you will stay inside the good-looking scope of post-processing. If you're gonna learn Black And White Landscape Techniques, you've got to understand Black and White Processing. This Guide from Photzy on Better Black and White will help you understand what you're doing wrong and how you can make it right! With pro photographer Kent DuFault showing you, you cannot go wrong! I never get tired of saying this: please shoot in RAW. This magnificent file format is the exact equivalent of film negatives. Don't restrain your camera's potential just because the files are a little extra-large. This allows you to shoot less and will impact the quality of your images. Composition is the foundation and blueprint of a great photograph. The image could be technically perfect in terms of exposure and focus, but if the composition is not interesting, the image itself will crumble in the ephemeral air of social media, the web and just life in general. The most important elements to consider when composing landscapes are lines and shapes. Lines can be horizontal, vertical, diagonal, organic and implied. And shapes are enhanced by slow apertures that capture the sharp beauty of their silhouettes (trees, boulders and mountains). When importing images into RAW development software, you'll encounter a poorly understood tool called clarity. Many photographers have the wrong idea that clarity improves focus. No, it just gives a sharper feeling. Improving focus in post-production is impossible. Good focusing is done in-camera. Clarity allows you to control the contrast of all the elements of a picture, especially when they are adjacent to differently lit objects (such as the sky, for example). This is fantastic for creating a separation of elements, which is really important to maintain texture and tones in a scene that are often the complete opposite of minimalism. Give all the elements the proper space and role in the scene by separating them from their neighboring tones using clarity – just don't overuse it. 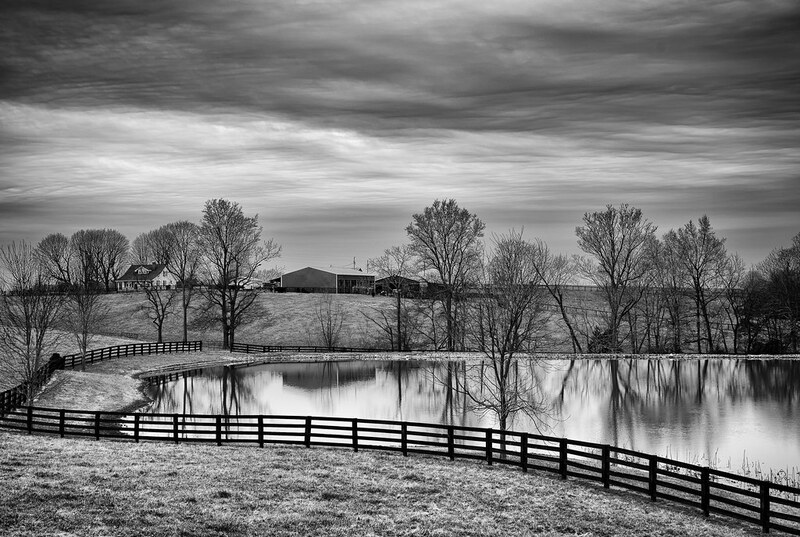 Improve your black and white landscape techniques by adding more interest to the image with foreground objects. This will give a richer feeling of depth and even tri-dimensionality when done right. So, we've covered quite a few points here in this article about the techniques used for producing top black and white landscape photos. None necessarily more important than the next, they all hold their own unique value because the process is different to that of color. Dealing with color landscapes requires a great deal of technique and those tips can be transferred over to learning black and white landscape techniques. I would suggest learning post production and the concept of tonal range for B&W images is really important! Know where you're going to shoot. Get some ideas down and go scouting, visit, explore and examine; this way you'll get a great vibe about your selected spot for your landscape session. Learn some technique in post. By this I would suggest understanding software like Lightroom, to achieve the desired result you're really after. Get to grips with understanding Dynamic Range. Having a pretty competent knowledge of contrast, clarity, highlights, shadows etc, will ensure you're reading your image's histogram correctly and achieving technically correct outcomes! Study the work of photographers that inspire you. A no brainer, but find people you like on blogs/forums/Facebook – anywhere. Get learning how others learn to “see in black and white”.